Anyone can create beautiful mixed media art. 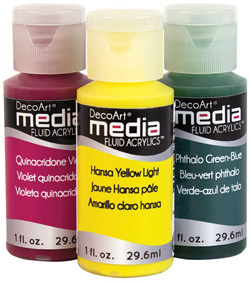 DecoArt's Media program includes products formulated to work seamlessly together to create amazing mixed media art. Included in the line are fluid acrylics, antiquing creams, misters, gessoes, mediums, crackles, varnishes, and textures. Made in the USA. Available in 56 colours including metallic and interference colours, in 1oz bottles. 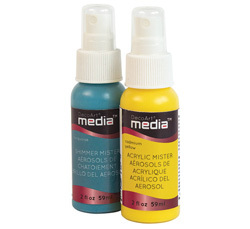 These professional grade misters are permanent, acid-free and transparent. They can be used alone or over fluid acrylics. Use with or without stencils and masking materials to create unique effects and background washes. The colors are intermixable and can be layered for multi-dimensional techniques. They are water-based, non-toxic and clean quickly and easily. Available in 2 oz. pump spray top bottles. Available in 12 colours in 2 oz bottles. 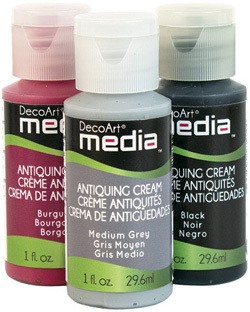 These matte creams are ideal for antiquing on non-porous surfaces. They are opaque, and non-permanent for unlimited working time prior to sealing. Once the cream is dry, it can be easily wiped from undesired areas with a damp cloth. The creams can also be buffed to a high sheen, easily sanded and distressed once dry. They can be sealed with varnishes for a permanent finish. They are fast drying, water-based, non-toxic and cleanup quickly and easily. Americana's Media line includes a range of grounds, mediums, glazes, and varnishes for achieving a variety of decorative finishes and effects. The gesso can be used as a primer to seal and add tooth to most surfaces for maximum acrylic and oil paint adhesion. It is highly pigmented and features smooth and flexible coverage with one coat. It can be thinned with water to the desired consistency. Dries quickly with a matte finish. It is water-based and non-toxic. The varnishes add durability and sheen to projects, and are made with non-yellowing polyurethane for a tough, flexible, crystal clear finish. They are water-based, non-toxic and fast drying, and work great for both interior and exterior use. Modelling Pastes, Crackle Mediums and Crackle Glazes, and other texturizing mediums are easy to use and offer a range of possibilities to explore.